I’ve been trying to think about which book would suit my last book of the week for the year 2017. What trends have there been, what news, what good coming out of the year? There’s a lot of doom and gloom with Brexit, Trump, and plastic in the environment, but I wanted to focus on the good things. One good thing, and slightly closer to home, is the surge of awareness of gender equality. Of society beginning to see women and girls as equal to men and boys and fighting harder for a lack of discrimination, harassment and stereotyping. There have been hugely successful children’s books covered by mainstream media, such as Goodnight Stories for Rebel Girls, but how do we teach our girls to not only look up to pioneers who went before them, but also to change the world for the better? Technology is a huge part of our modern world – a massive chunk of our children’s waking lives. So, rather than just getting them to use the technology, let’s teach them to understand how it works. You can’t beat an algorithm if you don’t understand it. Recently, various girls in my school have been learning to code. And one pioneer of this revolution is Reshma Saujani. You can see her TED talk here, which explains why we should be teaching girls bravery rather than perfection – a key message in her book too. Girls Who Code: Learn to Code and Change the World is proving to be helpful in many ways. It is not just a manual for learning to code – in fact it’s not for beginners learning to code, but a resource to explain coding, and to promote confidence in doing so. The book doesn’t teach a specific coding language – as say Usborne Coding for Beginners Using Python, which is a step-by-step guide and a very useful one at that. Rather, Girls Who Code tries to indicate the logic and theory behind programming, often using cartoons in real-life applications to extricate the meaning of making the code. Although it might sound complex at first, with a little concentration my pre-tween tester completely understood the premise. There’s also coding history and interviews with women working in programming, all of which give the message that STEM is great for girls, but that also failing and retrying are essential. Wrapped up in these is Saujani’s key message that perfection is not what girls should be striving for, but aiming instead to learn from mistakes. After all, penicillin was discovered by mistake; the first pacemaker was invented by mistake too. As was Coca-Cola – and look how successful that became. Of course, the fun bit of coding is included in the book too – fun projects with apps, games and art etc. 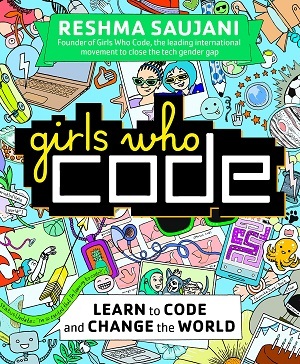 Throughout the book are illustrations in one-tone teal, which show a diverse cast of girls learning to code, with speech bubbles, diagrams and comics – these break up the text and are hugely informative. In the end, the idea is that as well as understanding what coding is, and how to go about it, girls will understand how useful it is, how accessible computer science is. With a knowledge of programming, girls can go on to solve problems, take control, and in essence, change the world. An admirable book to look forward to a new year. You can buy it here.